Fingertip injuries are some of the most common hand injuries, and they can have a devastating impact on your daily routine. This might seem a bit surprising when you consider how small your fingertips are as compared to the rest of your hands. Additionally, the large number of nerves in your fingertips can make them very sensitive to pain, and not being able to use even one of your fingers can prevent you from grasping objects, typing, shaking hands, and performing many other commonplace tasks. The team at Tahoe Fracture & Orthopedic Medical Clinic’s Reno, Nevada, office has extensive experience in treating fingertip injuries, and we can help relieve your pain and restore your hand function. 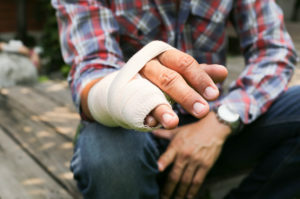 Fractures — We often treat broken fingers using a splint, brace, or cast, and in more severe cases, we can also perform surgery to repair the fracture. If you think you may have fractured a finger, please don’t wait to seek treatment. A delay in addressing a broken bone can lead to nonunion (a failure to heal properly) or an infection. Sprains/strains — If you’ve injured a finger muscle or ligament, we can treat it using conservative methods, such as medication, compression, and icing. Dislocations — A finger can become dislocated if it is either jammed or overextended. We often treat dislocated fingers using manual manipulation, traction, or surgery. Mallet finger — Mallet finger (also known as “drop finger,” “hammer finger,” or “baseball finger”) occurs when an object strikes a fingertip and forces it to bend too far. This can cause the fingertip to droop and prevent the finger from being completely straightened. We can generally treat these fingertip injuries without surgery by applying a splint, although some cases may require surgical intervention. Jersey finger — Unlike mallet finger, where an extended finger is forced to flex, jersey finger occurs when a flexed finger is forced to extend, thereby preventing the fingertip from bending. Surgery is often required to treat these fingertip injuries. If you suspect that you may have sustained one of these fingertip injuries, please schedule an appointment at Tahoe Fracture & Orthopedic Medical Clinic’s Reno, NV, office as soon as possible, as delaying treatment can lead to increased pain, as well as permanent disability or deformity. We look forward to helping you determine the best course of treatment for your injury.